Before Pluto was discovered in the 1930′s Mars was the planetary ruler of Scorpio. Today, we consider Mars the fiery ruler of Aries and Pluto the emotional intense ruler of Scorpio. Both Mars and Pluto have a potent charge to their energies and when you hook them up together you activate the Martian drive for transformation on the deepest level. Pluto is at 8 degrees Capricorn, slowly moving through this Saturn-ruled sign of authority, government structures, and the systems that hold our social structures together, working to destroy and dismantle the old, outdated, conventional ways things have been done, replacing with new, upgraded, more fitting systems. That’s on the macro level. On the personal level wherever Pluto is working in your chart, the same thing is happening. 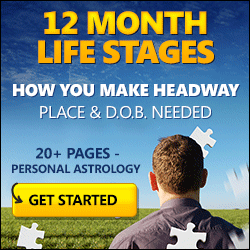 When Pluto is busy in your chart you can be sure that is a major construction zone. Pay attention. Wear your hard hat and marvel at the possibilities for an entirely new way of experiencing your life. Participate in making it so. I like to use OPALIZED QUARTZ to aid transition and transformation. I wear it right on my body or hold it in my hand as I sleep.